Today, I'm writing about the World War I drama All Quiet on the Western Front (1930), starring Lew Ayres (left) and Louis Wolheim. This article is part of Banned and Blacklisted: The CMBA Fall 2017 Blogathon. You can read the other entries here. "Death is not an adventure to those who stand face to face with it," the prologue to All Quiet on the Western Front (1930). All Quiet on the Western Front has the distinction of being one of the most banned movies ever made in the old Hollywood studio system. This drama about ordinary German soldiers trying to survive in the trenches of World War I won two Academy Awards, but, at various times, it has been heavily censored, condemned by members of the US military and banned by the Third Reich. All Quiet on the Western Front is an adaptation of German writer Erich Maria Remarque's landmark 1928 novel that was based on his infantry service during World War I. Remarque's frank account of the horrors of trench warfare made the novel an immediate worldwide sensation (incidentally, All Quiet on the Western Front is a frequently banned book; it was a favored item for Nazi book-burning rallies). Universal Pictures chief Carl Laemmle and his son, producer Carl Laemmle, Jr., were looking to burnish the reputation of their studio so they paid a handsome sum for the rights to the novel. The Laemmles hired journeyman director Lewis Milestone and the then relatively unknown Ayres for the lead role. The result was a landmark film that won the best picture and best director Oscars and was hailed as a masterpiece for its technical sophistication and its anti-war message. The Variety reviewer wrote, "The League of Nations [a precursor to the United Nations] could make no better investment than to buy up the master-print, reproduce it in every language, to be shown in all the nations until the word 'war' is taken out of the dictionaries." However, not everyone approved of All Quiet on the Western Front. A rising German political organization, The National Socialist German Workers' Party or Nazis, and their leader, World War I infantry veteran Adolf Hitler, were virulently opposed to the film (these views were shared by the more conservative members of the German public, who viewed All Quiet on the Western Front as a painful reminder of the humiliating defeat of World War I). 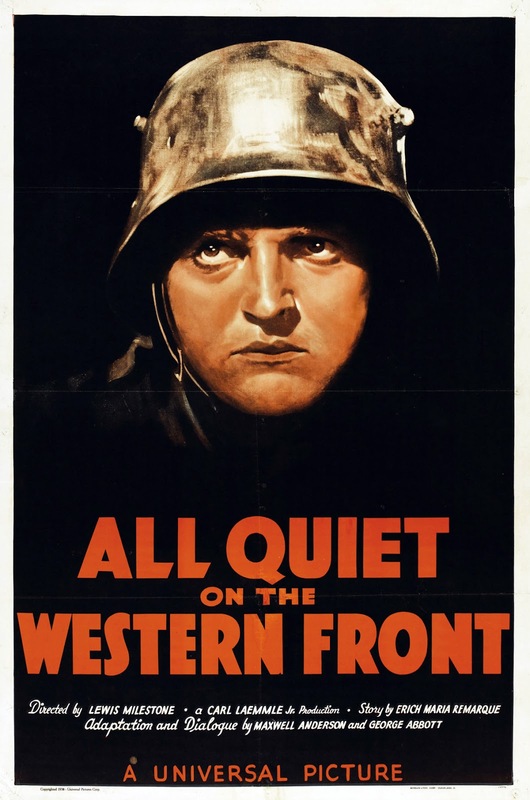 All Quiet on the Western Front had a brief and controversial run in German theaters, and the Nazis capitalized on all of the bad publicity by protesting outside movie theaters; the party faithful even disrupted some screenings by setting off stink bombs, throwing sneezing powder (!) into the air, and releasing rodents into the theaters. 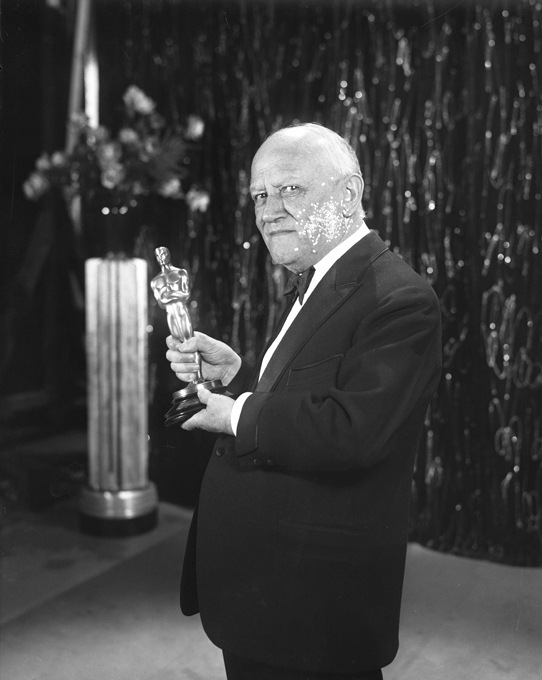 Carl Laemmle with his Academy Award for All Quiet on the Western Front (1930). All Quiet on the Western Front also received a frosty reception elsewhere. It was banned at one time or another in France and Poland because of its supposed pro-German sentiment, and members of the U.S. military condemned the film because they felt it was damaging recruiting efforts. Ironically, when the movie was re-released in 1939, it ran afoul of the motion picture censors not for its anti-war message, but for its scenes depicting the soldiers spending the night with three French girls. Viewed today, it's obvious why All Quiet on the Western Front has received such strong reactions through the years. It is a film of unusual power, depicting one of the most cataclysmic events in human history with an unflinching honesty. The soldiers in All Quiet on the Western Front do not cheerfully sacrifice their lives for a noble cause; instead, they are frightened and terrified young men who are thrown into an international conflict that they do not understand. Their time in the army begins when the are subjected to cruel bullying during basic training, and it immediately gets worse when they arrive in the trenches. They are subject to disease, rodents, constant shelling, and poisonous gas, but the psychic pain they experience is perhaps the worst of all. 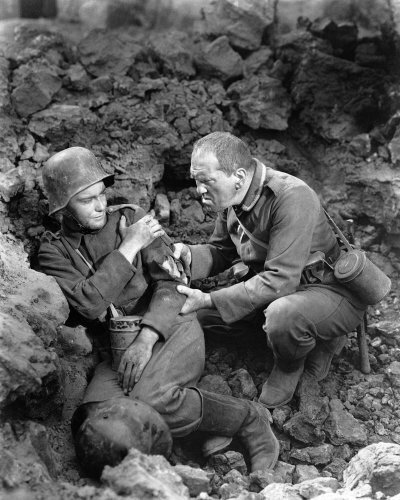 Ayres is particularly heart-rending in the famous scene where he begs for forgiveness from the French soldier (Raymond Griffith) he mortally wounded (Ayres became a lifelong pacifist because of his experience making All Quiet on the Western Front). The final scene is perhaps the most moving in cinema history. Milestone superimposed the ghostly images of the dead soldiers over a military graveyard, and one-by-one they turn and face the audience in what amounts to a silent plea for remembrance. The artistry of all those involved in All Quiet on the Western Front ensures that anyone who sees the film will never forget. All Quiet on the Western Front is available on DVD and video on demand. I remember seeing this film on TV many, many years ago and the profound effect it had on me personally. I'm sure it had much to do with the beginnings of my own views on war. I particularly remember Lew Ayres' affecting performance. Nice work, Amanda, and an excellent choice for the blogathon. I have seen both the silent and sound versions of All Quiet on the Western Front and both are extremely powerful. I cannot imagine how anyone could fail to be moved. "reminder of humiliation" "detrimental to recruiting efforts" - What is wrong with people?! We can take heart that none of the banning or censoring of this novel and film have ever been successful. The classroom scene in this movie is the one that lingers in my memory all these years -- there are very few movies gutsy enough to come right out and condemn the insanity of war and of senselessly sending young men off to die. Well-written piece, Amanda. Well done. I agree with Ivan. The classroom is a powerful and truthful indictment on the meaningless of war. Great choice! A powerful film that I've heard convinced its star, Lew Ayers, of the pointlessness of war, leading to his position as a conscientious objector (and Medic) during World War II. This is such a powerful and courageous film. Seems those are the kind that always have to battle the censors. Thanks for a great review. Today we are so accustomed to anti-war films that the effect of watching one, even of an earlier era, may not be as powerful as it could be. AQOTWF is truly a great movie, on so many levels, but it is hard to imagine it being banned. But, times were different, and those making this film were breaking new ground while demonstrating great courage. Thanks for telling the story behind this one! This is one of my favorite films, and one of the most powerful ever made. I love it so much, and I'm glad it's not a propaganda movie, but an anti-war one, showing German boys as flawed but believable human beings. There are so few films about WW1, compared to WW2. But the ones that did get made are beyond genre -- The Big Parade, Wings, The Patent Leather Kid, Four Sons, Hell's Angels, The Dawn Patrol, Journey's End -- none of these are exactly run of the mill. But AQ is arguably the greatest. It's a;most embarrassing to think it was once banned, anywhere.